Next week I travel through Chicago to Rockford Illinois to see a house being built by a team of American and Swedish high school students, and their instructors. They are adapting Swedish techniques to the available American building materials. Does that sound familiar? It sounds a lot like the USA New Wall. So where did this house come from? 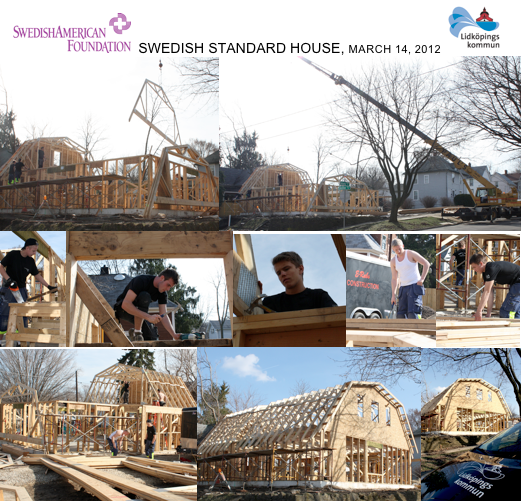 What are Swedish students doing in the USA building houses? What's going on here? A little back story is in order. Rockford Illinois has a strong Swedish heritage, with many Swedish immigrants settling and founding industry in the city. The Swedish history and culture is still strong today and Rockford maintains a Sister City relationship with Lidköping Sweden with whom they promote economic development for both cities. Ok, so there are Swedes in Illinois - but how about this house? The SwedishAmerican Health System in Rockford has a Foundation that among other activities helps develop and redevelop housing in the neighborhoods surrounding the Hospital. They've completed dozens of projects in the neighborhood, many with the local Habitat for Humanity. The vocational program at the local High School has been involved with working on the builds of these projects, so at one point the connection was made to form an exchange program where by Swedish students from Lidköping could come to the US and participate in building a house here, and the American students could do the same in Sweden. Ok, we see it now. House building, exchange students, but how did they come to build a Swedish house? Well soon after the first group of Swedish students and instructors arrived they were on the site of the first house project. As the Swedes were being oriented to the American construction a question came up, the kind of question that in retrospect strikes closer to the heart of the matter than you realize at the time. And the question was "Where is the rest of your wall?" Of course there was no good answer for this. What happened in the intervening time is that the instructors have conducted an exchange of ideas and technology, and have applied them to a series of three houses built by the students in this program. The first house they worked on was dubbed "The American Standard House" which was built largely as we do here. The second house was "The Swedish Influenced House" which began to apply the Swedish lesson in insulating and air sealing. 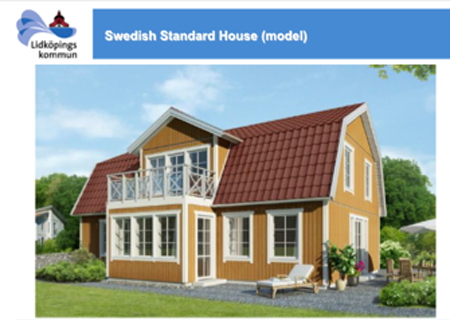 The current project is "The Swedish Standard House" which will apply the lessons cumulative to date, and is even being made to look like a traditional Swedish vernacular house. So next week I'll see it, learn about the technical details, talk to the instructors and students, take pictures and video I hope, and report back. I can't say strongly enough how I believe that the techniques used for building houses in Sweden are the best and most relevant solutions for turning around our housing industry in the US. The techniques are practical, they use a similar skill set to our current practices, and in fact have grown out of the same tradition of stud framed house building. I believe that this is the way we will build houses here in the US, whether I told you about it or not, its the natural evolution of our status quo toward greater energy efficiency. This simple house in Rockford Illinois is the future of American home building. And as the first house built this way in the country, I have to say that this modest house is the most important Green house in the USA. And they weren't even trying. Modest. Unassuming. Lagom! Would love to see performance numbers from the 3 houses. I wonder if they are similar enough in size, orientation and location to make a indisputable statement. Such a study would be interesting. Unfortunately the houses are sold off, so besides no guarantee of cooperation from the new owners, unless the operational parameters were kept similar the results could skew. One owner may keep the thermostat low, another higher, one may sleep with the window open in winter... Simply tracking energy use is not enough information to understand the performance. Putting in place what would be needed to collect the data in a useful way was never part of the mission here. The house designs and orientations are all different, so with all these other variables its difficult to take out relevant data about how the wall performed. Ultimately I don't think this sheds much light on what we already know. We won't discover that the wall with less insulation performs better. We might find the house with the better solar orientation and south facing windows uses less energy despite its wall design? I think this is more about demonstrating that can be easy to step up performance, that your average builder already has the skills and know how to do this, and to point the way for people to raise the bar on their expectations.